Do you want to study for MindTree Placement Papers, don’t worry we will help you. You can find the Latest MindTree Practise questions and Study Material on PrepInsta. 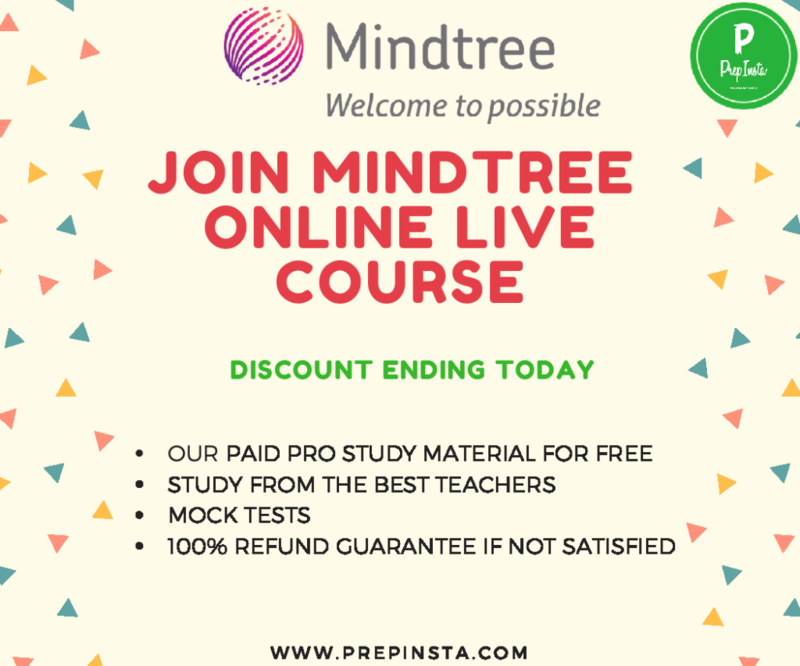 MindTree Previous Questions level is of moderate difficulty, studying from our MindTree Specific Practise Questions can increase your percentile highly and you will be able to easily solve questions asked in MindTree Previous Papers. Syllabus for MindTree given on our Dashboard will be the most helpful, find out more about MindTree Syllabus in PDF Download and Test Pattern for Written test papers, Questions for MindTree Mock Test Papers and Sample Papers with model Question Paper, MindTree Written Test Papers. MindTree Conducts its First Round while hiring for freshers and outsources the paper to third party, you should only study from here for MindTree Questions. MindTree is currently hiring Check this page to Apply. MindTree Coding Section for practise of Programming Questions can be found on our MindTree Coding Dashboard below. This is only asked in a few colleges or drives and not generally asked also. But you may check the essay writing section if you want. Quantitative Aptitude Topics like Algebra, Speed time and Distance, LCM and HCF, Permutation Combinations, LCM and HCF are there in the test and the questions papers consists 60-70% from the above mentioned most important topics. Logical Reasoning includes questions from the following section -Data sufficiency, blood relations, directional sense, coding deductive logic etc. English or verbal Ability section most of the questions that are asked are from the following topics and questions on synonyms, antonyms, sentence completion, and correction etc. Coding has 2 variety of questiosn in this section the first question is of easy difficulty level and mostly of pattern based and the 2nd one is of medium difficulty level. Before anything we highly recommend you to go through detailed statistics for MindTree Process. Ques. What is the level of difficulty for MindTree Written Test Papers? Ans. For MindTree Written Test Papers the level of difficulty is Medium but the time creates problems as very less people are able to solve the sections in time. Ques. I have heard that aptitude questions for mindtree section is the hardest of all the sections asked in the exam? Ans. No, its a common misinterpretation that aptitude questions for mindtree is hard rather Logical Reasoning is the most troublesome for students. Ques. I have heard that Mindtree previous Questions section is the most difficult section in the exam? Ans. No mindtree placement questions is not the most difficult section rather logical reasoning is. This placement season, Mindtree visited our college for on-campus placements. As per the company eligibility criteria, only students with 65 and above percentage in 10th, 12th, and undergraduate were shortlisted for the interview process. Fortunately, I fulfilled the eligibility criteria, and so was able to attend the interview process. Primarily, the interview process consisted of following three rounds. Under this test, 25 mathematics questions were asked, which were based on algebra, percentage, number system, profit and loss, time, work, and distance, arithmetic, and probability were asked. The time limit for this section was 35 minutes. This sections consisted 25 simple English questions related to synonyms, antonyms, sentence correction, and completion. This section of the written test had 24 questions on coding and decoding, seating arrangements, blood relations, and puzzles. Input 5 numbers in an array and find the Pythagorean triplets in them and print it. Since the test was online, the scores were revealed immediately after test completion. Fortunately, I cleared all the cut-offs and was shortlisted for the technical interview round. PrepInsta was a great help to me while I was preparing for this written test. Me: Gave a brief introduction about my family, school, college, and hobbies. Interviewer: You like photography? Which is the most recent picture that you clicked? Me: Yes, sir. I shot a picture of a child playing in the rain. Interviewer: That’s wonderful. Tell me something about your major project and what was your role in it. Me: I explained the functioning and utility of the project and briefly described my role. Interviewer: Very Well! What is normalization? Why is it important? Me: I explained normalization, and it’s importance. Also, I mentioned where I used normalization in my project. Interviewer: Good. Do you know what is a Binary Tree ? Me: Yes. Then I explained binary tree. Interviewer: Can you write a program for Fibonacci series using recursive function? Me: Yes Sir. I wrote the program. Interviewer: I am done from my side do you have any questions? Me: I asked him some questions related to the office environment, work culture, etc. Interviewer politely answered all my questions, and then I greeted him and left the cabin. An hour later results of the technical interview were announced, and luckily, I was shortlisted for the HR interview. Interviewer: Good afternoon Parimala have a seat. Interviewer: I’m fine how are you? Interviewer: Did you have your lunch? Interviewer: Tell me about your family. Me: I narrated my family background. Interviewer: What are your strengths and weaknesses? Me: I told him about the same. Interviewer: Why do you want to work with Mindtree. Me: I explained my reasons for choosing Mindtree. Then the interviewer explained the details of the bond, and discussed salary details, job location, timings, etc. I agreed with everything. Two days after the interview, result got declared, and I was selected. It was the moment of immense happiness and pride for me.